'Zooloretto' invites us to become zoo managers. This may sound like a rather tough job. However, in this game we don’t have to invest, attract visitors, or ‘really’ work; we can focus on the more attractive parts of the job: obtaining the animals. For free! Sounds rather attractive, doesn’t it? 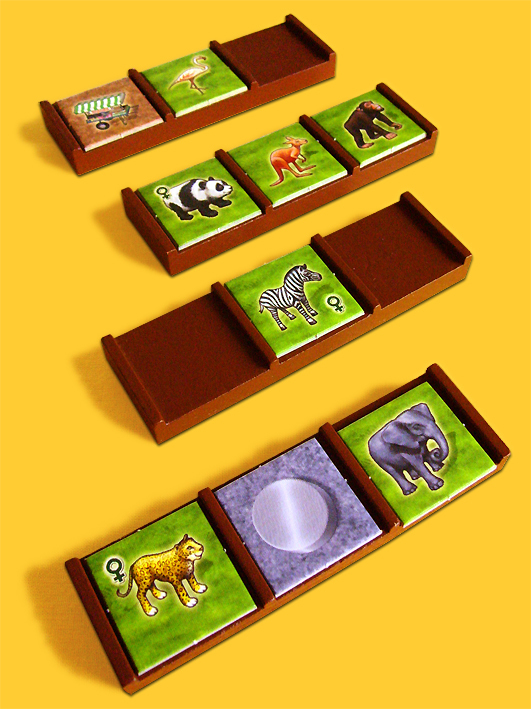 With 'Zooloretto' each player gets his playing board depicting a zoo. This zoo consists of a number of enclosures and a barn. At several locations throughout the zoo building sites are planned for the nowadays inevitable eating and drinking stalls. The zoo can be expanded with a fourth enclosure, but this requires money. In the beginning it all is rather quiet and dull: the zoo is completely empty. Each player starts with two coins. Aim of the game is to score as much points as possible by inhabiting the enclosures and building of stalls. 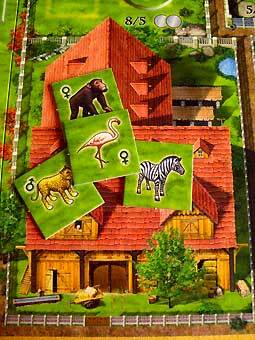 The animals (eight species in total) and stalls are depicted by small cardboard tiles which are shuffled and stacked upside down in the middle of the table. The tiles are obtained during a number of rounds. The tiles are being delivered by a sort of transport vehicles that with a lot of fantasy could indeed be regarded as the delivery trucks they are intended to represent. There is exactly one delivery truck available for each player, and with each truck a maximum of three tiles can be delivered. On a player’s turn, three options are available to him: either blindly draw a tile and add it to a truck, or perform a money action, or take a delivery with its tiles and place them around the zoo. After a player’s choice for a truck the round for him is over, while the others continue. A round ends when each player has made his choice. After choosing a truck, the player has to distribute the tiles across the available enclosures and the barn. Of course, each enclosure can only contain one type of animal. The stalls are placed on their building sites (or also in the barn for possible future use). At the start of the game a stack of 15 tiles has been placed aside. When it is necessary to draw tiles from this stack, it means the last round is being played, after which the scoring takes place. Whenever a player chooses to draw a tile to place it on a truck, he has to take care not to leave a favourable combination for any player. On the other hand, the player wants to have a useful combination for himself on his next turn. That’s the main dilemma of this game. Another dilemma occurs whenever a player is the last one still in the round: either draw another tile (when still possible of course), or take the combination currently available? Points are scored for the enclosures and stalls in different ways. A completely full enclosure, the player gets points equal to the larger of the two values shown for this enclosure. For a enclosure with one empty space, the player gets points equal to the smaller of the two values. When the player has fewer animals in the enclosure, he still gets one point per tile, however, only when he has built a stall next to this enclosure. Additionally, the player gets two points for each type of stall he has been able to build. Points are subtracted for everything still in the barn: minus two points for every type of animal or stall. The player with the most points wins, and in the event of a tie, the player with the most money. Ah, yes, money, the other option in a turn! After the meagre two starting coins, coin tiles are also among the tiles delivered by the trucks. 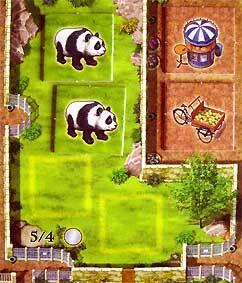 Moreover, players get a money bonus for some enclosures that are filled by animals during the game. What to do with your money? Zooloretto provides several possibilities. For 1 coin either one animal tile can be moved (an animal from the barn to an enclosure, or a stall arbitrarily), or one type of animals can be exchanged with another one. For 2 coins any tile can be bought from the barn from another player, who cannot refuse this! One coin goes to this player, another goes to the bank. Another option with 2 coins is to remove one single tile from the barn (and from the game). Finally, for 3 coins, a player can extend the zoo, which can be done one time during the game. Nice feature: when the appropriate partner for a female or male animal is placed in the same enclosure they immediate produce offspring; a cute (free) baby tile can be added to the same enclosure. The more experienced player has easily recognized the playing mechanics: 'Zooloretto' is the board game version of the 'Coloretto' card game. The boardgame has not only inherited the basic mechanics, but also the name and design from its predecessor. 'Coloretto' is well-known as a short, easy finisher after a gaming session. 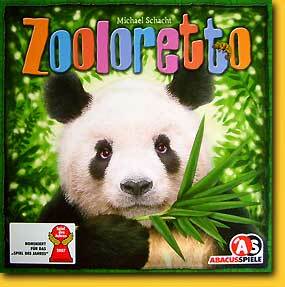 Zooloretto, being a board game, has more pretensions, but can fulfil these only partly. While the 'luck-of-the-draw' of the card game is being compensated by playing several rounds, with the board game we have to settle for one single, long round. And when then things are not going right, well, the zoo might as well be closed prematurely. As an addition the money actions are available, giving some nice tactical possibilities, but it will not really challenge the more experienced board game player. 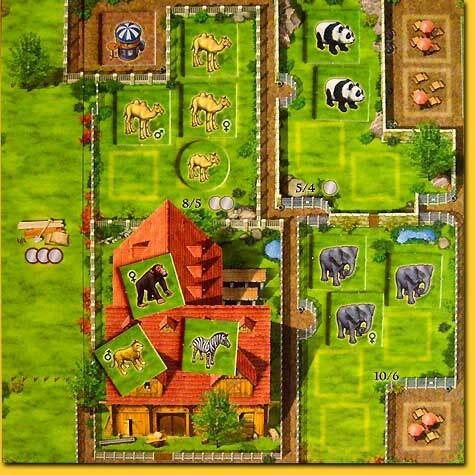 However, Zooloretto’s theme, nice design and short playing time make it very well suited as a game with (young) children. For the more inspired parents there are several potential teaching moments: how to manage the available money and space, but also the birds and the bees could be discussed. The game seems almost written to the mission statement of the Spiel des Jahres jury. No surprise that the game has won this prestigious price this year, and therefore it is expected to be found under a lot of German Christmas trees coming winter. As a price winner, however, 'Zooloretto' does not fulfil the gateway function of some of its illustrious predecessors, mainly due to its large dependence on the luck-of-the draw, limited gamer’s influence and (therefore) limited replayability.